A flight on an aerobatic airplane-probably the best gift! Considering yourself extreme? Have you ever heard about the “Barrel roll”, “Cuban Eight” a “Dead loop”? Now you have an opportunity not only to hear but also to feel it! Aerobatics-is the strongest adrenaline rush of all. Moments spent in the sky, will be remembered for a lifetime! A real extreme activity that allows to escape from the daily worries, feel the excitement of a victory over your fears. Only few things can be compared with the adrenaline of negative and positive G’s. Aerial Extreme-an emotional restart, which will create a strong new wave positive in your life. Many other video can be found on our Youtube channel, this masterpiece video above, by Activelifevideo team, is just an example. There are many reasons customers are choosing us. 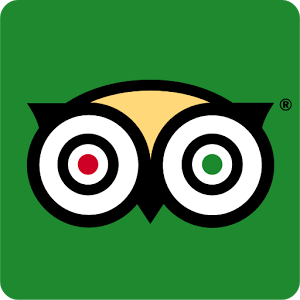 Satisfied customers are coming back for new extreme experiences. It is extremely important, what kind of people are involved in the creation of atmosphere. 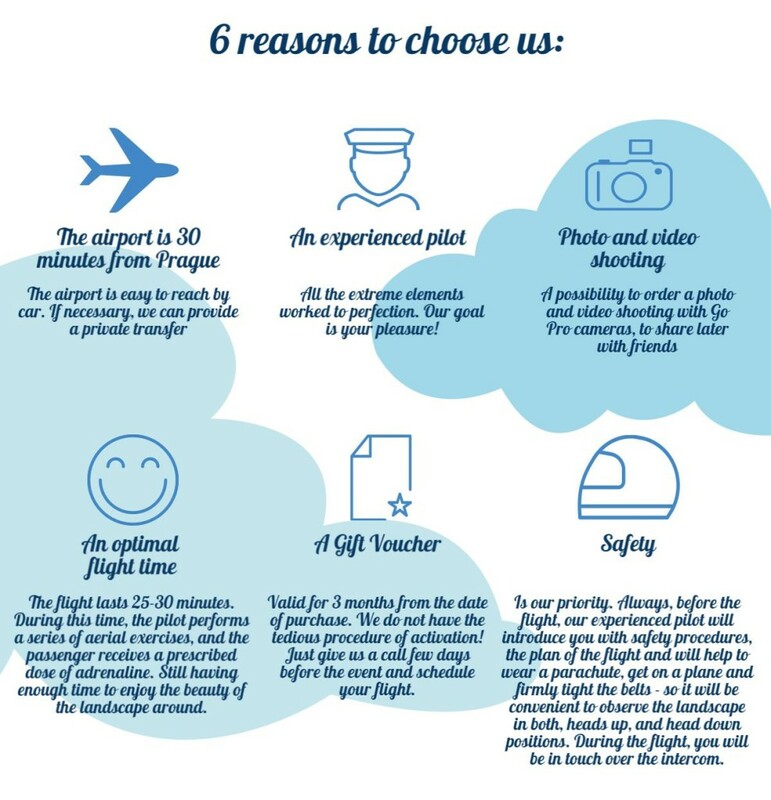 Our charismatic pilots are always funny and inspiring everyone who is joining them in the air. All the extreme elements worked to perfection. Our goal is your pleasure! Possibility to order a photo and video shooting with Go Pro cameras, allows you to share emotions with friends-see example video of an aerobatics flight footage below. The flight lasts 25-30 minutes. During this time, a pilot performs a series of aerial exercises, and the passenger receives a prescribed dose of adrenaline. Still having enough time to enjoy the beauty of the landscape around. Purchased certificates-Valid for 3 months from the date of purchase. We do not have the tedious procedure of activation! Just give us a call a few days before the event and schedule your flight. Is our priority. Always, before the flight, our experienced pilot will introduce you with safety procedures, the plan of the flight and will help to wear a parachute, get on a plane and firmly tight the belts-so it will be convenient to observe the landscape in both, heads up, and head down positions. During the flight, you will be in touch over the intercom. 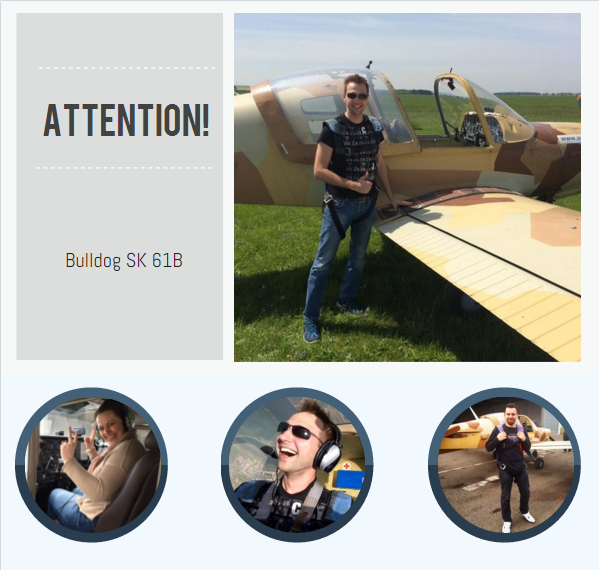 Our aircraft for acrobatics bearing a nice name “Bulldog” (Bulldog SK 61B)-yes, just as in the Disney cartoon about airplanes. This sports plane with virtually unlimited possibilities. It was delivered for the Royal Air Forces, of the United Kingdom, but also was flying for the Swedish Air Force, Hungary and other countries in Europe, Latin America and Africa. Gift certificate for aerobatic flight usually is given to the most courageous and loved. Connoisseurs of extreme and those who are ready to discover an extraordinary way to the sky. 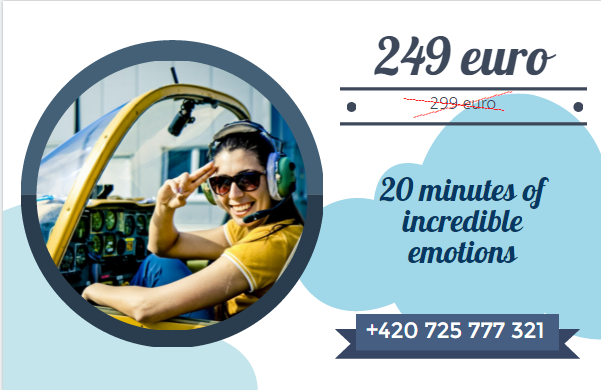 Unforgettable emotions guaranteed!